I wasn’t going to make any type of resolutions for the New Year, just like everyone else I make resolutions and soon they are broken. However, all that changed when I found this great New Year’s resolutions printable on Pinterest from Mique at ThirtyHandmadeDays.com …. I knew I had to do it. So, thanks to the cute printable….. here are my “one word” and goals for 2012. I chose the word “efficient” because I want to be productive in saving time, not putting too much on my plate and take advantage of opportunities that truly interest me. My favorite goal for this year is “Say No more than yes”. I always find myself juggling too many projects, I’m hoping to choose wiser in 2012. 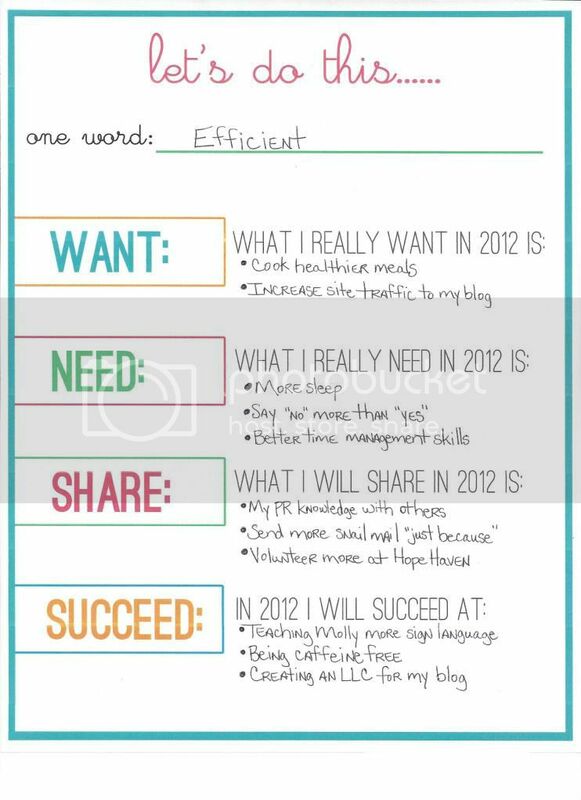 I love this printable because it includes the words Want, Need, Share, Succeed – each of them such powerful words and really required me to think a lot about myself and this new year. I’ve got my goals printed out and framed on my desk, practically staring me in the face. I’m excited to see what I accomplish this year. Here’s hoping I stay close to my goals! Stay tuned next week, I’m excited to show you the new meal planning chart I’ve got in place for our family too! Don’t forget to check out ThirtyHandmadeDays.com to get this printable and make your own goals and resolutions for 2012! Great goals! A lot of mine are the same as yours! Better more efficient, better at time management and saying no more than yes for sure! Thank you! I’m excited about my goals for this year! So excited to see we share a few of the same ones! Thank you, Mique! I am so in love with your printable – I just had to do it! And now that it’s on my desk staring me in the face..I’m motivated! Thanks for stopping by! This is absolutely fantastic! I am printing it out now. Thanks so much for sharing!! Yay! So glad you like it! I think it’s a great way to keep up with goals for the year! I loved the idea of having them on your desk. I am going to have to steal that. I made a bucket list for 2012, but I like this way for my work resolution. I am going to work on them now though some of yours will be the same as mine. Thanks Cassie! I think having it staring at me every day will help keep me focused on my goals! 🙂 Good luck coming up with your resolutions! Love it! I usually just write my goals in a notebook. Like this better. Thanks Kerri, I appreciate it! Happy New Year to you! I love this idea, I really need to do this as well bc I’ve been writing all my stuff done on post-its this is nice to have it all in one place. Thanks for sharing the free printable! Thanks for stopping by, Samantha! Enjoy the printable! What a great way to keep your New Year’s resolutions! What a great Resolution idea, thanks!! Thanks so much, Hanan! Happy New Year! Carrie, I love it! the printable AND the goals! Thanks for sharing! Thank you, Glenda! I appreciate it! Happy New Year! Love this idea. The one thing I want to do this year is to be more engaged in everything I do. The frame is an excellent idea! What a great idea to print them out and post them where you can see them each day. THAT is commitment! Thank you! I felt like that was the best way to keep me motivated and “on task”. Happy New Year! I’m not a resolution maker either. Fruitless actually! I’m more of a sparkle reacher…I think your sparkles are fabulous for the coming year! Thank you so much, Christy! Happy New Year to you! I’m trying to cut down on caffeine as well. Now, leave me alone. Just kidding 🙂 But getting off the hard drugs (coffee) has been a little rough! Hi, stopping by from Content Brew. I’ve run across your blog before and like reading your posts. Hope you’re doing well on your goals so far. If you need a volunteer to soak up your PR knowledge, I’m game. Catch up with you next week!